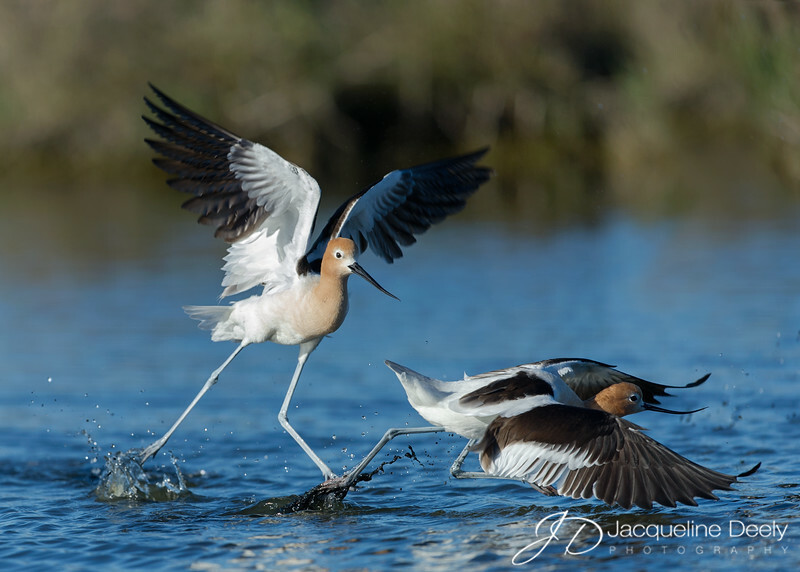 These bickering american avocets at Palo Alto Baylands were featured in the November/December 2013 issue of California Watchable Wildlife Magazine. The image was also among those selected and on display at Filoli Garden's 2014 "Bay Area Wildlife Exhibit". Bounded by Mountain View and East Palo Alto, the 1,940-acre Baylands Preserve is one of the largest tracts of undisturbed marshland remaining in the San Francisco Bay and is considered to be one of the best bird watching areas on the west coast. American avocets are a common sight here, along with a massive array of other birds that traverse through the bay area during migration. During the summer months and breeding season, they exhibit the beautiful cinnamon coloration as seen in this image. They can also be very territorial, as they bicker over nesting sites and will aggressively protect their young, sometimes physically striking intruders including raptors. In response to predators, they sometimes issue a series of call notes that gradually changes pitch, simulating the Doppler effect, thus making its approach seem much faster that it actually is. Chicks leave the nest within 24 hours after hatching and can walk, swim and even dive to escape predators! American avocets are important members of their ecosystem; because of their food habits they likely have a regulatory influence on insect and crustacean populations, and they are an important food source for their predators. They also have an influence on the plants and seeds they eat. Currently protected by the US Migratory Bird Act, American avocets are making a comeback after over-hunting in the 19th and early 20th centuries. The main threats to American avocets today are habitat loss and degradation.